This is one of the few pre-packaged teas we will sell at Experience TeaTM and we do so because of the purpose it represents. We believe strongly in efforts to improve education for people of underdeveloped countries that lead to positive, sustainable social change. This is a black tea and it is available both in tea bag form and loose-leaf. Do good while doing tea. Ajiri Tea was started with the social mission of creating employment for the people of western Kenya and of educating the local orphans. Through the sale of Ajiri Tea, the principals hope to create a sustainable cycle of community employment and education. Ajiri means “to employ” in Swahili, the national language of Kenya. 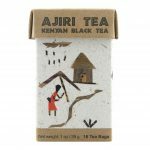 Ajiri buys its tea from a tea factory in the Kisii district of Kenya and employs women in Kisii to handcraft the box labels, beads, and twine. All profits are sent back to the community through their donation to the Ajiri Foundation to educate orphans by paying their school fees and purchasing their books and uniforms. 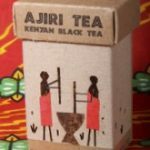 By supporting farmers, employing women to create the unique handmade labels on every tea box, and paying school fees for orphans, Ajiri and Experience Tea hope to make a difference in Kenya today and in the future. Find out more about Ajiri at Ajiritea.com.